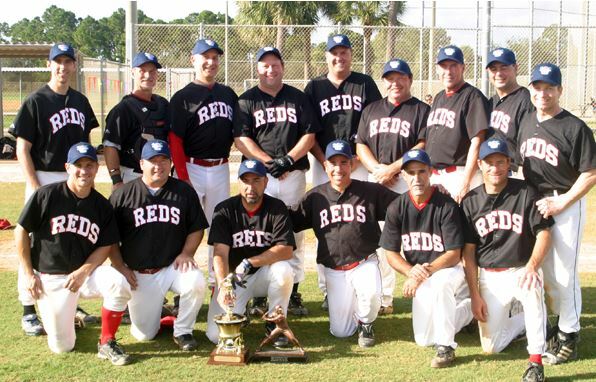 45+ Wood Bat Central DIvision Champs, the New Jersey Reds. Jupiter, Fla. – New Jersey Reds manager Andy Vazquez knew grabbing an early lead was of the utmost importance. Making three key defensive plays however, proved to be the difference. John Crillo’s two-run double highlighted a three-run first inning and New Jersey never trailed in a 4-2 victory over the Tennessee-based Volcanoes in the finals of the 45 Central Wood Bat Division at the 2001 Fall Classic. “It’s always important [to get an early lead], but the reality is that we hit the ball well all game,” Vazquez said. “Only some great plays by [the Volcanoes] kept us from putting more runs on the board. That’s when it gets to be a stressful situation. Brian Tobiasz scored twice, including a key sixth-inning insurance run on a Jeff Hall double that pushed the lead to 4-1. From there, the Reds relied on pitching and defense to secure the title. John Dragos made a diving catch in center field of a John Denny liner with two on and two out to keep the lead at three, before Hall turned a Jay Janke sixth-inning liner to short into a double play to end a bases-loaded, one-out threat. Just to top off an outstanding day in which he finished 2-for-4, Hall ended the Volcanoes’ final comeback bid after Gene Morey drew a ninth-inning leadoff walk. Hall turned Janke’s grounder into a 6-3 double play that cleared the bases and all but settled the issue. The Fall Classic title was the third for Vazquez, but first since 2006. Prior to the victory over the Volcanoes, the Reds, who finished round-robin play 5-0 before winning playoff games over the Patriotas de Venezuela (7-6) and the Delco Blue Rocks (10-1), had lost in the championship game following the 2007 and 2010 tournaments. For the Volcanoes’ Andy Tillman, the conciliatory speech following the game has become a scene played out far too often for his liking. Tillman has won three championships, but is now a five time runner up – including two losses as a coach. Dragos finished 2-for-3 and scored the game’s first run as a catalyst for the Reds from the leadoff position, while Crillo added a pair of hits. Carl Novak finished 3-for-4, while Nick Vaught, Phil Ward and Morey each had two hits for the Volcanoes, which went 4-1 in round robin-play before defeating the New York Pirates 10-4 and the Fort Worth Phillies 4-2 to reach the title game. The Volcanoes scored single runs in the second when Denny’s ground out to third scored Janke and the eighth when Vaught led off the eighth by being hit with a pitch, stole second and scored on Novak’s two-out single. But when Hall turned his double play in the ninth, then grabbed the final out off Denny’s bat, the Reds gave Vazquez another title.